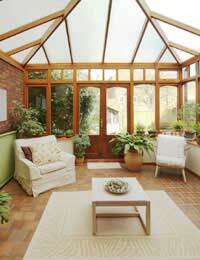 Home > Extension Options > Transparent Conservatory Roofs: Glass or Plastic? Unless you are considering a tiled roof or a flat roof there will only be two choices for a conservatory roof, it's between glass and plastic. Both have their good points and bad points so lets take a look at those and decide which material will be the best for your conservatory. Plastic, or to be more accurate, polycarbonate roofs are made from a number of sheets of polycarbonate with a cellular structure giving an air gap between the sheets. Often know by the general name of 'twinwall', as the first products to reach the market had just two layers, plastic roofing sheets are now available with up to five layers. The more layers there are the greater the insulation value is but each extra layer also cuts down the amount of light that comes through. Plastic roofs are a lot lighter than glass roofs and a lot cheaper. These two attributes make plastic far more likely to be used on cheap conservatories. Ordinary translucent plastic will never be as clear as glass but this can be a good thing or bad, depending on the situation of your conservatory. Less light might be a bonus for conservatories in very exposed positions. There are now different finishes available rather than simple translucent plastic. Green tints are good for cutting down the amount of light transmitted through the roof in the height of summer. A bronze tint has the same effect but not to the same extent but is liked by many people as it doesn't show the dirt as easily as clear plastic. It is also possible to get a white finish which blocks out more direct light than bronze or green but feels lighter. The white (sometimes called 'opal') finish is often used in north facing conservatories because there's then no need to fit blinds. Glass is heavier and more expensive than plastic but with double glazing and a wide variety of special finishes available it will always be a better insulator. It will allow more light through as well. Glass is more difficult to fit than plastic and the extra weight means a more robust supporting structure, all of which increases the cost of the whole conservatory, not just the roof. However, many people consider that glass is better looking and looks classier than polycarbonate sheeting. A glass roof will be more resistant to staining from algae, something that polycarbonate roofs can suffer from if the pitch is too shallow for rainwater to drain off quickly. Staining from overhanging trees and shrubs will also be worse, and possibly permanent, with plastic. Glass is more impervious to stains and dirt and can be strong enough to rest on while cleaning (check with your conservatory builder or manufacturer before attempting this!). Security concerns are perhaps fewer with glass than plastic. The better supporting structure of a glass roof means that windows can be set into the roof, which isn’t easy with plastic. The windows could be used as an access point if not closed properly but double glazing is very hard to break. Plastic roofs, on the other hand, can be cut with a hacksaw or pushed in if enough weight is placed on them. Both methods of entering a property are very noisy though, and only worth attempting if a thief is quite certain a property is empty. Glass is definitely the better of the two materials when it comes to insulation. When looking at both materials the 'U' value will indicate how good an insulator the material is, whether it is glass or plastic. But remember that the lowest 'U' values are the better insulators, not the other way round. With the e-coatings or argon-filled double glazing available today, plastic really is way down on double glazing in its insulating properties. The reality is that a glass roof will be better insulated, look better, be more comfortable to sit under and last longer than a plastic roof. But it will cost a lot more and if that means the difference between having a conservatory or doing without, then plastic will have to be the right choice.